Tom Blair, producer of the Drum Corps International on ESPN2 broadcast, was at work today in Chicago with broadcast personalities Steve Rondinaro and Dennis Delucia to record the final voiceover work on the 2006 World Championship broadcast for ESPN2. 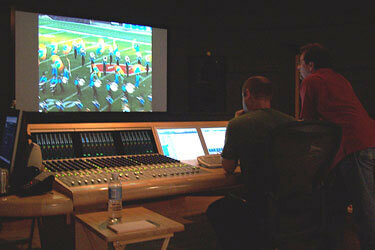 Tom Blair (standing) reviews playback in the audio editing suite used for the ESPN2 broadcast. DCI Executive Director Dan Acheson, who was in attendance at the voiceover session, said: "It's very exciting to see the broadcast come together on this level. There is great attention to detail put into this post-production phase to ready the program for its national release. We are very excited to present the program for the second year on ESPN2 on Sept. 5." The Drum Corps International World Championship broadcast will air on the ESPN2 network on Sept. 5 at 8 p.m. Eastern time.